In this second of our two lessons on IP video types, we will discuss the various forms of video and how the choice of transport protocol affects output. 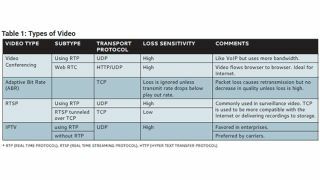 As you recall from the first lesson, IP video is nearly always carried by TCP (Transmission Control Protocol) or UDP (User Datagram Protocol). TCP guarantees delivery at the expense of some additional complexity and bandwidth. UDP is simple, but cannot guarantee delivery. One method of categorizing IP video is shown in Table 1. Video conferencing behaves like VoIP, possibly because it evolved from it. So, for the first 15 years we used RTP as voice did. This conference video flows through a bridge to mix the video and audio for output. Relativity low levels of loss cause distortion. Consequently, FEC (forward error correction) is often added since retransmission is impossible. WebRTC flows from one browser to the partner’s browser. It uses HTTP like regular browsing. However, this HTTP is over UDP. Therefore, both forms of video conferencing traffic are sensitive to network loss. It also includes a new form of video often called DASH (Dynamic Adaptive Streaming over HTTP). DASH is the common name for the standard that evolved from the attempt to integrate the three popular techniques above. The video is transferred in “chunks” usually consisting of ten seconds of video. It uses TCP. So retransmission can and often does happen. As long as the chunks arrive in time to keep the playout buffer partially full, the video plays with no degradation. If you’ve watched Netflix, Hulu or similar services, you have seen ABR video. RTPS is preferred by the video surveillance industry and is also used in other applications. Most often the video session is set up using TCP RTSP. Then, after UDP ports are selected, the transport of the video is done between the UDP ports. Since it uses UDP, it will be sensitive to loss. If guaranteed delivery is necessary, a method that embeds the RTP/UDP packets within TCP packets can be used. Called RTSP over TCP, it is a tunneling method similar to that used in VPNs (virtual private networks). Finally, IPTV always uses UDP, so it’s very sensitive to loss. Some loss can be overcome by using FEC. The video is formatted using the mpeg transport guidelines which have been used in satellite transported video for years. While it is common for vendors to allow the addition RTP to the packets, this is not necessary for successful deployment. Phil Hippensteel, PhD, teaches at Penn State Harrisburg. Read more lessons on avnetwork.com.